Sunil’s family has always expressed their love in sharing NW Indian food, and this has extended to him devoting his life to food by constantly learning traditional Gujarati cooking from his mother, and becoming a farmer. Although the cuisine is from across the ocean, Sunil’s farming background, and worldly travels makes for a thali spanning the range of the diverse array of Indian cuisines, and sometimes delving into further Eastern flavors and even Mexican. A local-seasonal menu cooked from scratch, with care for earth, nutrition, and heart-to-heart culinary delight, leads to a feeling of fusion but still a wholly Indian experience. 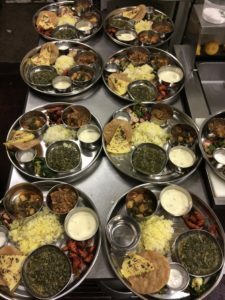 Thali, literally meaning “plate,” refers to the typical way a meal is eaten in an Indian household and many Indian restaurants. The full pallette of tastes and textures adorn the plate in small bowls and plates, allowing the eater to mix and match the many different components to make the perfect bite. LOGISTICS: Arrive at 6pm, and you will be seated and served a starter and water. Feel free to stop at the bar and order a wine pairing or beer. Courses are not typical in an Indian meal, and all items including the sweets are served up all on the same plate. Chai served at the end. DIETARY RESTRICTIONS: May’s dinner will be ovo-lacto-vegetarian. Please let us know when you arrive if you would like us to leave anything off your thali. If you are interested in vegan dinners, email to get put on a list for dairy free/vegan, and you’ll be the first to hear about future menus specific to those restrictions.